My intent is to make artistic, beautiful and inspiring instruments that sound and feel as good as they look. Click on a banjo below to see more pics and some of them have sound clips. Handmade instruments are as individual as people and they should absolutely inspire you to play your best. I run a one man shop, producing around 24 banjos annually. My goal is to make some of the finest, most tastefully decorated banjos available, as well as unadorned with equally fine craftsmanship. Please contact me to get on my wait list, prices starting at $2,000. The carved details are additional cost, depending on design. ​These are hookless banjos. They are free of hooks, bolts, nuts and tension hoops and all the unnecessary weight associated! 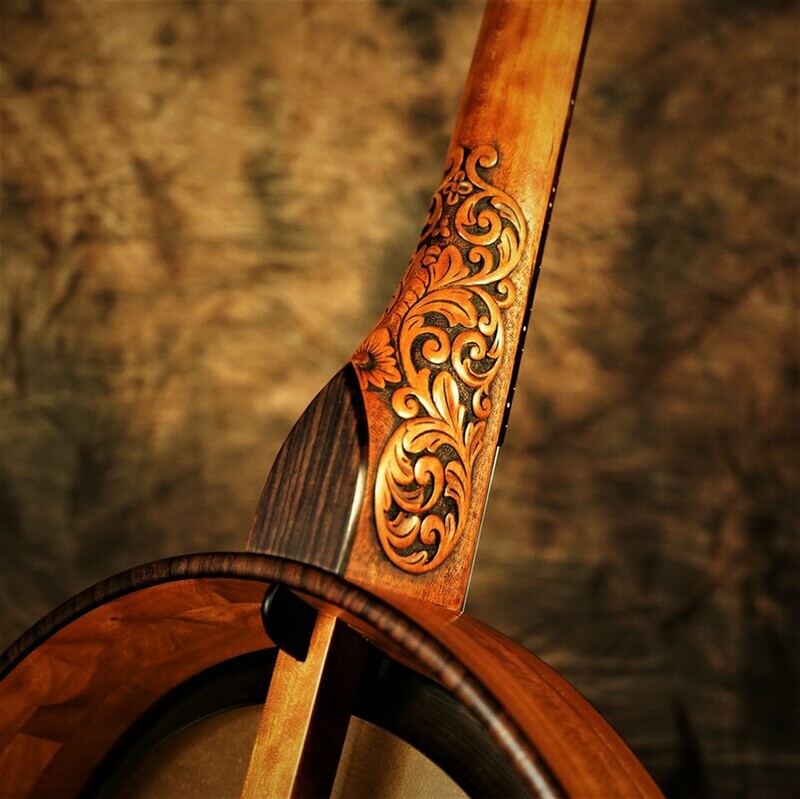 They utilize a bent wood tension hoop, held tight with brass screws threading into brass threads inset in the rim. They're easy to adjust and durable. The banjos are very light weight and comfortable to play. No cold metal hardware to chill your skin and poke your leg! Plus, the light weight opens up the tone and makes it very responsive. The tone is clear, rich and full at any fret, resonant and mellow, nicely balanced for any type of string. Most banjos favor one string type (steel or gut) but these sound great for both! ​Different woods give different tones, cherry and maple gives you a more focused sound, you hear individual notes more strongly. Walnut gives a warmer, woody sound; you hear more resonance and it seems more forgiving. The tone rings have different qualities. Describing tone is like describing color- it's best your form your own opinions from the sound clips. No tone ring is a wonderful option, it's very balanced and warm. Thin brass ring adds pop and density to the treble. Dobson adds a chime like resonance and increased treble. Rosewood adds a brightness while keeping a natural woody resonance. Feel free to write me with any questions. Thanks for visiting! Tone and playability come first, artistry comes next. 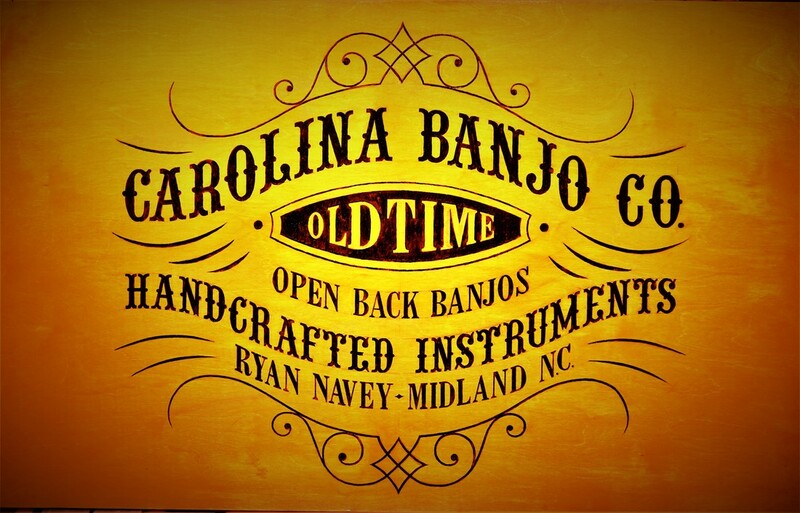 20 years of experience, careful design and old world craftsmanship make the banjos truly one of a kind.